Annuals, (10-)30-150 cm; tap-rooted. Stems 1, erect (often with purple or purplish brown areas), glabrous or glabrate, sometimes strigillose in leaf axils. Leaves thin (green to dark green), margins often strigilloso-ciliolate, faces glabrous; basal withering by flowering, long-petiolate (petiole bases sheathing), sparsely ciliate, blades ovate to oblanceolate, 10-90 × 6-14 mm, bases attenuate to cuneate, rounded, margins entire or serrulate or crenulate, apices rounded, obtuse, or acute; proximal cauline withering by flowering, petiolate, subpetiolate, or sessile, blades narrowly lanceolate or subulate, 20-100(-200) × 1.5-10(-20) mm, bases attenuate, margins subentire, entire, or serrulate, apices acute to acuminate; distal sessile, blades narrowly lanceolate to subulate, 5-113 × 0.5-5.5 mm, apices acuminate. Heads (10-) 30-100(-150), in open, diffuse, paniculiform arrays. Peduncles (0.2-)0.5-4 cm, bracts 4-8(-17). Involucres cylindric to turbinate, 5-7(-8.2) mm. Phyllaries in 3-5 series, broadly or narrowly lanceolate to subulate, unequal, bases indurate, margins hyaline, often purple-tinged, entire, green zones lanceolate (usually narrow, sometimes broad and covering most of distal portion), apices acute, faces glabrous. Ray florets 16-30(-54) in 1-3 series; corollas white, pink, or lavender, laminae 1.3-7 × 0.2-1.3 mm. Disc florets 4-10(-13); corollas yel-low, sometimes tinged with purple, 3.4-5.2 mm, throats narrowly funnelform, lobes ± spreading to erect, nar-rowly triangular, 0.3-0.7 mm, glabrous. Cypselae light brown to purple, narrowly obovoid to fusiform, some-times ± compressed, (1.2-)1.5-2.7(-3) mm, 5-nerved, faces sparsely strigillose; pappi white, (3-)3.5-5.5 mm. Five varieties of Symphyotrichum subulatum are recognized for North America based on differences in chromosome number, ray lamina color and size, array shapes, number of series of ray florets, number of disc and ray florets, and other, more cryptic characters (S. D. Sundberg 2004). These varieties were treated as species by G. L. Nesom (1994b, 2005d). Variety ligulatum is apparently an obligate outcrosser and is the least variable variety (Sundberg). Other varieties are self-compatible, which could facilitate the fixation of mutations in populations. The five varieties are nearly entirely allopatric, and intermediates between pairs of varieties are not uncommon where they approach one another. Populations that are intermediate in ray lamina size between vars. ligulatum and parviflorum are widespread in southern Texas, New Mexico, Arizona, and northern Mexico. Intermediates between vars. elongatum and parviflorum and between vars. elongatum and subulatum occur in Florida. Despite these observations, hybridization experiments and chromosome number differences suggest that the varieties are mostly reproductively isolated (S. D. Sundberg 1986, 2004). In older floras the name Aster exilis Elliott has been applied to Symphyotrichum subulatum vars. ligulatum and parviflorum. 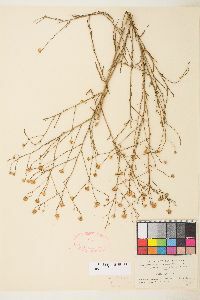 The status of this name is uncertain; the type specimen has been lost and the description of the plant is inadequate for determining the taxon to which the name should be applied (G. L. Nesom 1994b; S. D. Sundberg 2004).